Trico Lutkins sits down with Crimson Riders’ Zach Davis – INDIE VOLT! It has probably been about a year now but I still remember meeting Zach Davis. He was writing a comic book and wanted to pick my brain (it was slim pickings). A few months later he sent me a script that blew my mind! I couldn’t believe that this was his first script. I realized then that he was going to be the next big breakout talent. Hopefully, he remembers me when he’s writing for DC or Marvel. How did you come up with the concept for the Crimson Rider? Well, first off, thanks for the warm introduction! Underserved is an understatement. I didn’t come up with the concept for the Crimson Rider. It’s a public domain comic that was published in 1939 through Jumbo Comics. The original writer was by a guy named Fred Sande which is believed to be none other than Jack Kirby. The artist was the incredible Lou Fine. I read the book and liked it a lot, found out it was public domain and decided to take a stab at the character. It’s a simple premise, a teenage girl’s dad is murdered by a gang and she put on a costume to hunt them down. I added a new twist to the story, which I think fits well. It’s Mary Benton a.k.a The Crimson Rider, at a much older age, waiting in line at the gallows to be hung for the crimes of her past, telling her story to the other criminals in line. As soon as I read the original, I knew I wanted to see if I could add something new to her legacy. Will we see many callbacks or similarities to the original series? You will! There are callbacks littered all over, the gangs name is the same and her costume is close. There are a few characters from her original series that will be making appearances. Comics set in the Wild West are gaining popularity, what would you say is due to their resurgence? Man, you’re going to have to help me find these books. It seems to me that the genre has been pretty barren lately where comics are concerned. Of course, there’s Jonah Hex, The Sixth Gun and The Six Gun Gorilla but those have been done for a while. (Fingers crossed for a Jonah Hex rebirth). I know Landon Faulkner has a book, maybe they’re gaining traction on the indie scene. I’ll be on the lookout. 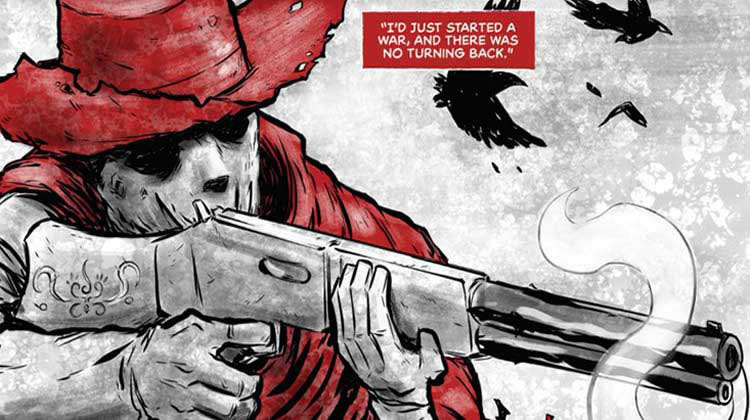 You and Landon Faulkner both write amazing comics based on the American West. My question for you is… which of you has the most epic beard? I’ll gladly hand this one to Landon, if for the length alone. I’ve never met him but he seems imposing. I don’t want to make him mad, you never know what he’s hiding under that hat! If you could cast anyone as the Crimson Rider Movie, who would it be? Damn, tough one. Maybe Sophie Turner, who plays the red haired Stark daughter on Game of Thrones as the teenage version of Mary Benton. I’d have to give it to Sigourney Weaver as the older version. I think that would be some pretty great casting. There was a very unique style choice to use red very sparingly. Was that because the character’s name is Crimson Rider? A few reasons and yes the Crimson Rider title was part of it, also I think using black, white and a single color has a neat effect. Sin city and The Rattler are a few comics that I think executed it very well. When I decided to write this book, it was pretty immediate that I made the decision to have the book be done in this manner. The artist on the book, Tyler Sowles, did an excellent and imaginative job on the book. The letterer, Justin Birch also made some awesome and very effective choices with the caption boxes using the same method. The book looks amazing if nothing else. How many issues will the series be? I had planned on four but have since decided that the story would be more effective and more fulfilling doing it in three issues, so that’s where we’re at. Three issues should totally encapsulate what I wanted to do. Is this the first comic you worked on? How was the experience? It is! The experience has been awesome, there’s a whole lot that goes into making even a single issue of a comic. The learning curve for me has been pretty big, I’ve gained a whole new respect for the writers that have multiple monthly titles. The biggest thing I’ve learned is not to be afraid to ask questions of those who have done it before. You, Travis Mcintire , Josh Werner and Bob Salley have had some great insight and have helped me immensely. I’m forever grateful to all of you, even if I was annoying as hell! What got you into comics? I read some when I was a kid, but didn’t really get into them until the ninth grade. I liked the pictures and the characters. I’ve always been a big fan of cool storytelling, I’ll take them any way I can get them. I worked at a pizza shop called Aldo’s and a lot of the dudes that worked there dug comics, so that’s where the passion really started. Those same guys also turned me into a metal head for life. Superboy #30 written by Karl Kesel, pencils by Tom Grummett and inks by Doug Hazlewood. It was part 6 of a 6 part story, proving that I’ve always been behind the times. I remember reading it and thinking, “hmm, there’s got to be something I missed!” The art work is great though, I still have the issue. What would you say your major influences as a writer are? I’m nowhere near the league of these guys, obviously, but some of my favorite writers and influences would have to be Stephen King, the master of horror and Ed Brubaker. I love the way Ed works his inner dialogue with his characters. He’s a master of crime, which is my favorite genre. His current book at Image, ‘Kill or be Killed’ is a great example of his excellence. If you could write for any property, what would it be? I would love a shot at Hawkman, he has such a great costume design. His background is so up in the air with all of the different origins he’s had that I think it would be cool playing in that sandbox. Another one I’d love a shot at is Swamp Thing, there are a lot of great things that can still be done with the character. 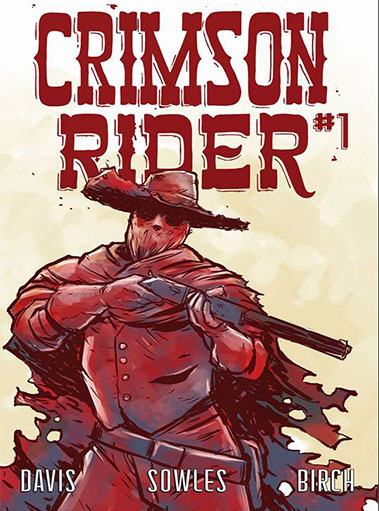 Kickstarter for issue one of Crimson Rider, I understand that the Kickstarter process is a project all its own. After that, I’ll get issue two and three rolling. From there, I have several different stories I’d like to tell, maybe try my hand at a detective/ crime story. Then, I must know, when can I get #1? Soon, the book is complete. I’m waiting on some prints to be finished for the Kickstarter that my friends are working on. I want to have as much done as I can before I launch the Kickstarter so that people won’t have to wait long for the book once they’ve supported it. You can go to my website, ZachDavisComics.com and sign up for my mailing list, where I’ll be keeping everyone up to date on the goings on with The Crimson Rider and upcoming projects. Also you can find me on Facebook, if you like comics, I’m sure we share friends on there. @ZachDavisComics on twitter and @ZachJewellDavis on Instagram. Thank you, Trico. This was fun! Trico Lutkins lives in his Colonial Ranch of Solitude with his sinister henchman (actually, she’s a hench-girl), Audrey, his wickedly awesome partner-in-crime, Tracy, his heralding hellhound, Sammy, and the silent yet deadly ninja-cat, Jack.